Condo is a 5 story building. 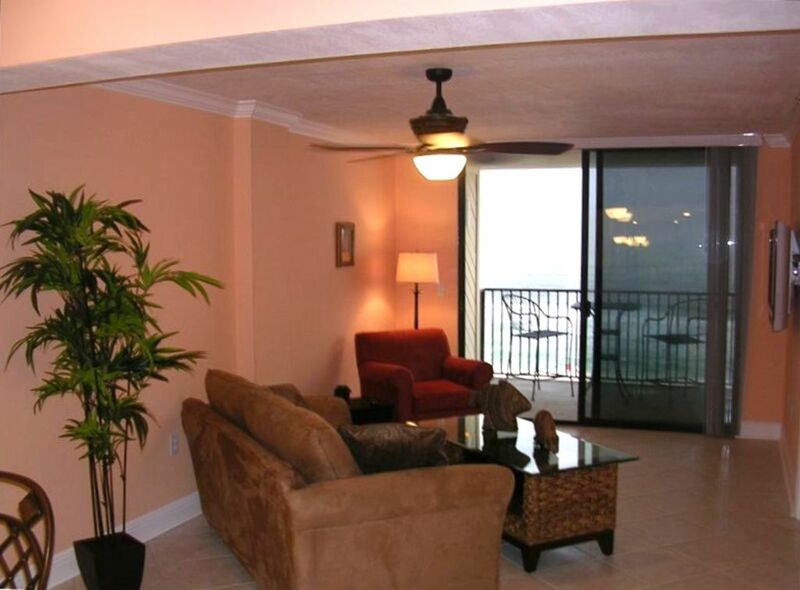 This condo is on third floor and overlooks the heated pool. The entire complex has been updated recentily. Condo has been recently renovated. Looks great and is comfy. All new tile, new kitchen, washer and dryer in unit, new TVs on wall, new beds. Just beautiful. The condo is located on beautiful Navarre Beach in the Flordia Panhandle. Located between Destin and Pensacola beach. Rent here on VRBO and save. Room was clean and equipped with all of our needs. Will need additional amenities like toilet paper, paper towels, dish washer tablets - room had plenty of garbage bags, dish soap, and hand soap in kitchen and bathrooms. Also equipped with front loader washer and dryer - will need to bring detergent and has an iron and ironing board. The washing machine being a front loader did have a mildew smell so just make sure to leave the door open. Good location and has a beautiful view from the balcony. 20 minutes for Pensacola and Fort Walton Beach. Condo building is being remodeled as of January 2019 so construction was going on around us and pool was closed for construction - could hear quite a bit of construction noise in the room, I believe they where remodeling above us. Over all a good stay and I would recommend this condo. Was perfect weather except for 2 days of rain so went to Naval Museum one of those days and visited an elderly cousin in Jay, Fl the other rain day. Bed was comfy but a little tall for me as I’m short but perfect for my husband. The recliner is a smaller size so was not able to use. Beautiful view from the nice balcony. There were several days of riptides so kids were limited in getting into the gulf. They hunted for beautiful shells by day and crabs with flashlights at night. I would definitely recommend this unit on the 3rd floor. Not very far from the elevator at all. There were plenty of garbage bags and dish soaps. You may need more washing powders and there were no paper towels, and only 1 roll of toilet paper per bath and they were on the rollers. Kitchen was well equipped with plenty of cooking pots and dishes etc. We loved the view and not a very busy beach, which was nice. Hope to return to Emerald Surf in Navarre. The condo and beach were awesome. Very clean and accommodating. One heads up, always lock your car. Just a heads up,car was left unlocked for 10 minutes and someone entered and took some things. So lesson learned. Even in nice areas you have to be cautious. Other than that we had a great time. Beach area was beautiful and condo had every thing we needed. This condo is in a small complex. The beach was not crowded and you are located further down the beach away from the larger complexes. The condo is not overly decorated; nice and spacious. The balcony is large enough to dine on or even play board games. The owner is quick to respond and made the whole process from booking to the actual stay a pleasurable process. Our family would definitely stay here again. Plenty of room and the walk to the beach was so short and simple. Beautiful place and perfect vacation! My impression from staying in the unit is that pictures are deceiving. The unit was not in great shape it’s pretty badly worn and actually I felt better cleaning it myself as my stay progressed. The only positive is the view and beach access. I am very sorry you feel this way. I have never had a single complaint about anything in my unit over the 14 years that I have owned it. I really don"t know what to do to make things any better since every other guest has told me that things are perfect. The pictures are not deceiving, because the pictures are the pictures of MY CONDO. So please tell me how they are deceiving?